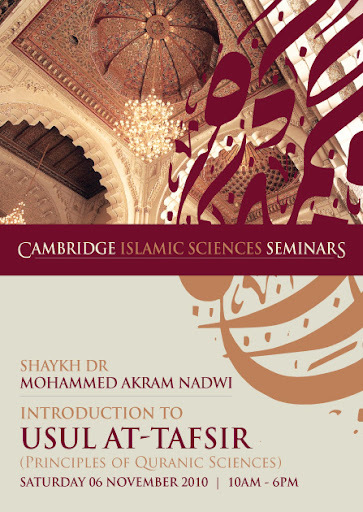 Perhaps you already know about the forthcoming Introduction to Usul al-Tafsir (Principles of Quranic Sciences) Course by Shaykh Dr Mohammed Akram Nadwi in Cambridge but, even though you could attend, have not yet signed up. You may be having some uncertainties about the course. This is totally understandable as it is sometimes difficult to see the benefits clearly and take the next steps with confidence. If that is the case then perhaps the following 8 reasons will give you enough motivation to sign up for the course without any further worries. This course provides a solid foundation in the history, sciences, interpretation and understanding of the Qur'an without which one may not necessarily know how to seek to understand the Qur'an. The Messenger of Allah, peace and blessings be upon him, said, "The best amongst you is the one who learns the Qur'an and teaches it.'' [Al-Bukhari]. The course is structured in a way that, although intensive, it is easy to follow. The feedback of those who attended the previous courses speak volumes. The course is taught by one of the best and the most knowledgeable scholars/teachers in the western world today, MashaAllah. The courses are held at the historic and prestigious Cambridge University - a world-class leading seat of learning and a fitting place for the Cambridge Islamic Sciences Seminars. You may, if you wish, request a Certificate of Attendance for your participation in the course. There is a significant discount if you book in advance. Your course fee is either fully refundable or fully transferable so you will not loose anything in case you are unable to attend due to unavoidable circumstances. What's more - if you attend the course and think that this course is not for you after the first session (for whatever reason) then you will be entitled to a full refund of your course fee. Yes, it is a 100% money back guarantee! We hope that these are enough reasons for you to join the upcoming course on Saturday 6th November InshaAllah. This is simply a brilliant and invaluable course that anyone would be hard-pressed to find something similar. Please note that the course is already 75% booked and also many sign up during the final week before the course. So if you are thinking of attending, then please sign up immediately before it is too late.